We visited Laugharne in the depth of winter – the third week of January to be precise, during a pretty cold spell. Actually, though, this particular bit of South Wales has a microclimate and compared with the rest of the UK, it was pretty warm and sunny. Okay, there were only a few hours of light, it was a bit muddy in places and you needed to wear boots and a winter coat. The sunshine was there though, and the glorious views we had over the estuary were heart-lifting. These views of course were shared by Dylan Thomas, whose boat-house home is just a few yards from the holiday lodge in which we stayed and the Owl and the Pussycat Tearooms. The Owl and the Pussycat is everything a creative café should be. It serves delicious home-cooked food, usually sourced from local ingredients. It provides a comfortable seating area as well as the normal café tables and chairs. Small craft items were on sale there when we visited. It was a also clearly used as a meeting point for people who had something to say – and in that sense it matched the Viennese coffee houses, on which the project is to some extent modelled. It is licensed, so had it been there in Thomas’s day, he may well have visited. It is the sort of place in which I could sit and write. The Owl and the Pussycat was most welcoming during our winter break in Dylan Thomas country. I’d like to welcome it into the Creative Café Project. 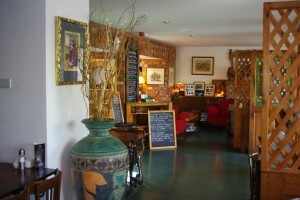 Visit The Owl and the Pussycat Tearooms.